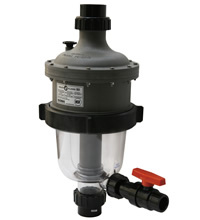 MultiCyclone is a pre-filtration device that is capable of saving water and reducing filter maintenance. The MultiCyclone works on the basis of centrifugal water filtration. There are no moving parts to wear and tear, and no filter media to clean or replace. MultiCyclone is ideal as a pre-filter, extending the life of your existing filter and cutting water consumption as it eases the workload on your swimming pool filter.